The property is well landscaped with mature trees and a beautiful, refreshing swimming pool. 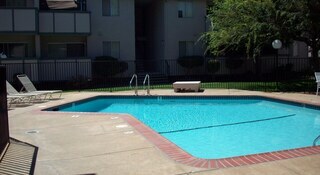 The property is gated and the building features two laundry rooms, controlled access entry, and an elevator. Parking Comment: Parking at The Woodlark Apartments is "Permit Only" parking. Each apartment receives one assigned covered parking space: open spaces are first come first serve for our residents.